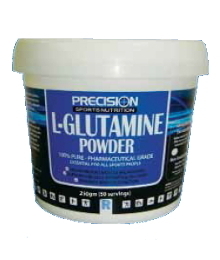 L-Glutamine is an amino acid supplement often overlooked for the more popular creatine. Where in reality the two are nothing alike and are often confused for doing the same thing. Sure they will both achieve muscle gain and cell volumisation, but that is where the similarities end. Some of the well-researched and documented benefits of glutamine are. Quite a list isn’t it. As far as I am concerned it is as important as a multivitamin, protein and vitamin C.
There is considerable evidence that suggest people with depleted glutamine levels show greater loss of muscle and longer periods of recovery from training, as we all know if we don’t recover we don’t grow! So, How Much L-Glutamine Do We Need? Because of the demand in so many areas of the body as shown above, to benefit in an increase in muscle you will need quite large amounts of this supplement. Fortunately it is fairly cost effective and easy to use. I recommend you use 0.2 g/kg (body weight)/ day. Eg: 9okg male would need 18g per day. When Do I Take L-Glutamine? then L-Glutamine is a must have supplement, right behind your purchase of Protein.